LC225XL Yellow x 1 (1,200 pages). The Brother MFC J4620DW is a multifunctional printer that incorporates copy, scan and fax capabilities. The printer measures 480 mm x 290 mm x 188 mm. It has a weight of 9.5 kg that makes it a portable device. The printer features USB, Ethernet and wireless interfaces. It has an onboard G3 33.6kbps fax modem. The printer is enabled for NFC connectivity plus memory stick and PictBridge cameras and the special-media feed. The printer also offers a 150-sheet input tray and a practical 20-page auto-feeder for longer scan and copy jobs. The high capacity MFC J4620DW Ink Cartridges reduces the average cost of printing. The printer handles all standard stationary up to A3 and features a bypass slot for wider and thicker genres. The print quality is good and the black text is clear and easy to read. Photo prints are smooth and natural, with decent colours and plenty of definition, even in the darker hues. It features automatic duplex printing for printing on the both sides of paper. The print speeds are stunning for a machine at its cost with 35 A4 pages per minute in monochrome and 27 pages in colour. The resolution is up to 6000 x 1200dpi that guarantee to deliver high print quality and even photographs boast magnificent colours and sharp outlines. It features a 3.7-inch swipe display and security such as WPA-PSK are other key attributes. The printer jams sometimes when printing heavier media. The Brother MFC J4620DW A4 colour multifunction inkjet printer with A3 saves energy and uses 32-watts when it is fully operational. The printer has a maximum 13,000 images-per-month duty cycle with MFC J4620DW Ink Cartridges that makes it ideal for home office or small business users. Q. Are MFC J4620DW ink cartridges suitable for other printers besides MFC J4620DW? Q. 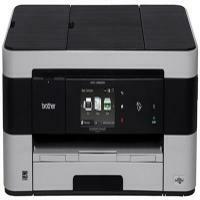 Does the Brother MFC J4620DW printer have fax printing facility? A. Yes, this printer is equipped to let you send and receive fax messages besides scanning and printing documents. Q. I performed print head cleaning procedure for my Brother MFC J4620DW printer having Brother MFC J4620DW ink cartridges at least twice. However, the cartridges got exhausted earlier and printed less pages. Is it because of print head cleaning? A. Print head cleaning consumes ink, which reduces the level that you otherwise utilise for printing. If print head cleaning is done often, you will be unable to print more as your ink is directed in the cleaning up procedure. Q. Will using compatible Brother MFC J4620DW ink cartridges invalidate the warranty on my printer? A. No, using compatibles for printing does not nullify the warranty on printers. Several people have been using compatible cartridges and are saving big. You just need to ensure that you don’t click on any pop-ups that try to induce you to accept certain terms as they can. Q. I just saw that a couple of colours are not visible in the printouts that I’ve taken since yesterday. I’m using Brother MFC J4620DW ink cartridges which I installed a few weeks back. Can I know what’s wrong and the solution? A. It appears that either the ink cartridges have not been installed in your printer properly or the nozzles in the print head have become clogged. Please check whether the cartridges are installed correctly in your printer and perform print head cleaning if they are alright. If you face further issues, you can speak to our customer service support. Q. How can I load the documents using ADF? Q. What are the dimensions of the printer? A. The printer weighs 9.5 kg measures up to 480 mm x 290 mm x 188 mm. Due to light in weight, can be carried easily from one place to other. Q. Will my Brother MFC J4620DW Ink Cartridges leak or dry up if not used frequently for a long time? A. Any cartridge would dry up if stored for a long time unused. It is advisable to print a test page or use the printer at least once every month to ensure the flawless working of the printer. Q. What should I do, when I receive blurred pages or the images become faded after transporting the machine from one place to other? A. If your printed text becomes blurred or images become faded, adjust the print alignment. After the print alignment is adjusted properly, the text will look sharper than previous. Q. I am not able to detect the remaining ink volume of the printer. What should I do now? A. If the quality of the ink used in the Brother MFC J4620DW Ink Cartridges is of low-quality or does not match the printer’s expectations, the machine may not detect the exact ink volume left. For this use a high-quality Brother MFC J4620DW Ink Cartridges. If the error is still not cleared, contact our customer care services at home.